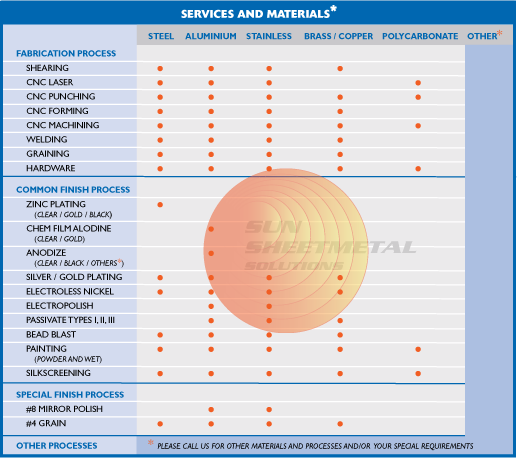 As illustrated by the accompanying table of Services and Materials, Sun Manufacturing Solutions has exceptionally complete sheet metal fabrication and machining capabilities and services,, including the availability of a #8 mirror polish on selected materials. We have the capability to provide both fabrication and machining in the same facility, which helps us achieve a high level of efficiency. The use of laser cutting eliminates tooling costs for prototypes. As illustrated by the table, we work with the full range of materials ... steel, aluminum, stainless, brass and copper, polycarbonate, and others. Our fabrication processes include CNC laser, punching, forming, and machining; shearing,; welding; graining; and hardware. We provide the common finishes...zinc plating: chem film alodine: anodize; sliver/gold plating; electroless nickel; electropolish; passivate types I, II, and III; bead blast; painting; and silkscreening ... plus special finishes: #8 mirror polish and # 4 grain. The Services and Materials table shows the available combinations of these processes and materials. Please call us for other materials and processes and/or your special requirements. The Services and Materials table lists our more common services — we invite your call to enable us to learn more about your unique requirements and how we can meet those requirements with our special capabilities.